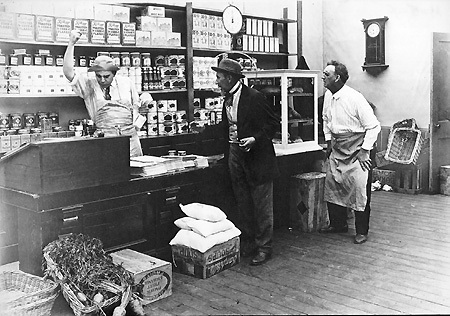 In an unidentified still (L), Riley Chamberlin (holding pipe) watches shopkeeper James Cruze, with Justus D. Barnes at far right. Thanhouser Career Synopsis: Riley Chamberlin was an important actor, primarily in comedy roles, with Thanhouser from 1912 to 1917. Biographical Notes: Riley Chamberlin was born in Byron, Michigan on November 7, 1854. He was educated at the Grand Rapids (Michigan) High School and graduated with the Class of 1873. Later in his life, he studied at Olivet College, Cornell University, and Columbia University. In 1907, his mother still lived in Grand Rapids, at 543 Cherry Street. Following his graduation from Cornell, in 1874 he joined C.H. Gardner's stock company at the Academy of Music, in Chicago, where he served as a utility man, making his debut with Oliver Doud Byron in Donald McKay, later appearing with the same actor in Across the Continent and Ben McCullough. Riley Chamberlin supported Frank Mayo in Davy Crockett, and was with F.S. Chanfrau in Kit, the Arkansaw Traveler, during the 1874-1875 season. Other appearances included engagements with Mrs. Chanfrau in Jealousy, with Clara Morris in Camille and L'Article 47, and with John McCullough in Macbeth, Virginius, Spartacus, and other productions. Riley Chamberlin was seen with J.L. Toole in The Artful Dodger, Off the Line, and Michael Garner. Then came appearances with W.J. Florence in The Ticket of Leave Man, which was staged in Chicago and also on a lengthy road tour. Later, he appeared with Florence in No Thoroughfare and Dombey & Son. He traveled with Adelaide Neilson in Romeo and Juliet, As You Like It, A Midsummer Night's Dream, and other plays, after which he was seen with Frank Aiken in The Ticket of Leave Man, The Lady of Lyons, and Don Cesar de Bazan. Riley Chamberlin left the stage at the end of the 1875 season, in response to the preference of his father. He engaged in other activities for six years, after which he was back on the boards in 1881, as St. Clair in Uncle Tom's Cabin, and as Nathan Lyffold in The Black Diamond. He then joined the Furnished Rooms road company, later purchasing the production and continuing it under his own management. He then left the stage for a period of three years. At one time Chamberlin found employment as a cowboy in Colorado, and for a period he was a horse trader in the Dakotas. In 1885 he was back on stage, where he remained for the next quarter century. During the late 1880s and early 1890s he spent several seasons with Walker Whiteside in Hamlet, and essayed various roles with comedy and musical companies. For the 1892-1893 season he was with the company presenting Ole Olsen, after which, in 1893-1894, he had a part in By Wits Outwitted. He appeared as Mr. Beetle with Effie Ellsler in Doris, and as Barney with Ellsler in Hazel Kirke, on the road during the 1894-1895 season. During the 1895-1897 seasons he was seen on tour as Ben Gay in A Trip to Chinatown. During 1897-1898 he was with several companies in such productions as The Silver King, The Speculator, and A Royal Secret, in support of Carl Haswin, Thomas Q. Seabrooke, Wilton Lackaye, and others. He appeared with Charles Coghlan in A Royal Box during the 1898-1899 season. In the summer of 1899 he was hired by Edwin Thanhouser for his stock company at the Academy Theatre, in Milwaukee. He remained with Thanhouser for five years, after which he joined the Proctor stock company for the 1906-1907 season. In 1907-1908 he was on tour in Spangles, around which time he was with Bertha Kalich in An Unbroken Road, followed by a 1908 tour with Ezra Kendall in A Land of Dollars, during which production he became ill and could not work. Upon his recovery he played the role of Wallers with Mabel Barrison in The Blue Mouse in New York City and road engagements in the 1909-1910 season. In 1910 he was seen as Justice Jackson, with Mabel Barrison and Harry Conor, in Lulu's Husbands, in Maxine Elliott's production of New York, Apr. 14, and on tour as Rem Blanchard with May Irwin, in Getting a Polish, as Tinker with Marie Dressler, in Tillie's Nightmare, and as Parissard in Madame X. In Milwaukee, on February 5, 1900, at which time he was employed at the Academy Theatre in Edwin Thanhouser's stock company, he married Jeanette Bayes, who was a sales clerk in a downtown store. On March 9, 1910, Mrs. Chamberlin, through her attorney, Julius E. Roehr, filed for divorce, stating that shortly after their marriage her husband "became cruel and inhuman, that he employed violent and abusive language to her, and even threatened bodily harm." A Milwaukee newspaper account stated: "She lived with him until October 4, 1909, when she decided that he was no longer a safe person with whom to live. Then she left him, and has not since resided with him. On October 15, 1909, Mrs. Chamberlin alleges, her husband came to her apartment in Brooklyn, New York, that he abused her, struck her, and threatened to kill her, holding a loaded revolver to her head. That was their last meeting. Finally, it is stated that the actor is earning from $240 to $250 a month." Chamberlin's attorney, John F. Donovan, said that countercharges would be launched against Mrs. Chamberlin and would involve people from Salt Lake City to New York City, and even New Orleans, but when the divorce hearing was held on July 27, 1910, no such defense was presented. In 1911 Riley Chamberlin's mailing address was 448 Jefferson Street, Milwaukee, Wisconsin. By this time, at the end of his stage career, he was a wealthy man. In Films With Thanhouser : Chamberlin joined Thanhouser in the spring of 1912 and appeared in many films from then until his death. His role as Conductor 786, the friendly captain of a streetcar, was a part of several films. Chamberlin was well known for his comedy roles. Around the studio he was a friend and favorite of many other employees. A notice in the June 26, 1912 issue of The New York Dramatic Mirror stated: "Riley Chamberlin is another addition to the Thanhouser forces. While never with Mr. Thanhouser in his film enterprise, he was principal comedian in the Thanhouser Stock Company at Milwaukee for many years. He is a finished performer of comedy parts and, as real funnymen' are scarce articles' in moving pictures, Chamberlin will be popular. His first appearance will be as Tom's father in Why Tom Signed the Pledge, June 14, and the farmer in Farm and Flat, June 28." Reel Life, June 6, 1914, carried this item: "Mr. Chamberlin is proud of his beautiful horses.... But best of everything in the world he loves children. Every day at rehearsals he is the center of attraction for the little actors and actresses - the Thanhouser Twins, the two little Turners, the Kidlet, Marie Eline and Leland Benham. They all cling around him, listening to his funny stories, and wherever he moves, the children's laughter follows. Character comedy is Mr. Chamberlin's favorite work in pictures. He puts fun and pathos into his part. An enthusiast recently has written him: The Jefferson of picturedom is Riley Chamberlin.'" In 1914, the Photoplay Arts Portfolio of Thanhouser Motion Picture Stars noted: "Riley Chamberlin is called the veteran' of the Thanhouser studio, having been with the company since its infancy.... He is 5'7" in height, has blue eyes, brown hair slightly tinged with gray, and weighs 148 pounds.... He is fond of all outdoor sports and excels any member of the Thanhouser company in playing golf. On his estate in New Rochelle he has many beautiful horses which are blue-ribbon winners and of which Riley is very proud. Mr. Chamberlin prefers to play character comedy parts. Mr. Chamberlin is noted for his comedy work in the Thanhouser pictures, and is a great favorite with the public, especially the kiddies, who are always ready for a laugh." A 1914 Biographical Sketch: Chamberlin was the subject of an article by John William Kellette in The New Rochelle Pioneer, November 14, 1914: "Riley Chamberlin, principal comedian of the Thanhouser Corporation, is the Jefferson of the photoplay screen,' that honor falling to Riley after years of popularity in the legitimate and his final entrance into the motion picture story art. Riley's big card is comedy, where he scintillates alone, but at times his lines fall in pleasant places,' and he's cast for heart-interest pictures where he brings forth all the pathos of the script, and leaves moist eyes for those who view the scenes. "Riley has reached the pinnacle of fame and is resting with the laurel wreath in his grasp. It didn't come in a minute, nor a month, nor a year. It came after vicissitudes and heartaches, and cycles of labor. All the glamour of the footlights had vanished when Edwin Thanhouser, who had Riley in stock in Milwaukee, brought him to New Rochelle to pose before the Kleigl lights and the camera, and the applause of the multitudes was missed, but far back in his sub-conscious mind came glints of crowds to urge him on to even better work. "Riley's voice used to be an asset as he trod the boards, and he still retains a singable tone that prevents him being shot when he would chant his muse, but in the silent drama all that is nil and he must depend upon his actions and mannerisms, of which he has many that grants him a pedestal for himself. It is not all peaches and cream to do one's best in a three flat side scene, with a director urging on the action, an assistant spotting the footage, and a cameraman cranking a Pathé, and it doesn't help a bit to have the usual onlooker slanting glances one's way and watching scenes where a man of Riley's temperament is booked for such slapstick work as getting kicked in the 18th rib and having his nose tweaked by an irate somebody, nor in being thrown down coal chutes and having coal dumped on one, but to Riley it comes in the game, and he's as willing and ready to be dropped from a roof into a life net, despite his 60 odd years young, as to dress in evening clothes and adopt a monocle. It was because of this fitting himself to his many unpleasant places that gave Riley Chamberlin the large following he has. And he's going to retain them. He's an Elk and is in love with New Rochelle. So what more could one ask?" "Mrs. Reynolds, who says that she is 26 years old and a character woman and leading lady for a motion picture concern in Bayonne, New Jersey, claimed Chamberlin gave her the ring and that he told many people so. She had two friends from Bayonne testify that he told him he had made her a present of it. She admitted the engagement was broken and said the reason was he had stipulated that she would have to cut off all home ties after marriage. She said she refused, though she loved him." Later Years: Riley Chamberlin was a mainstay in Falstaff comedies 1915-1916, including pictures produced at the Jacksonville studio in 1916. 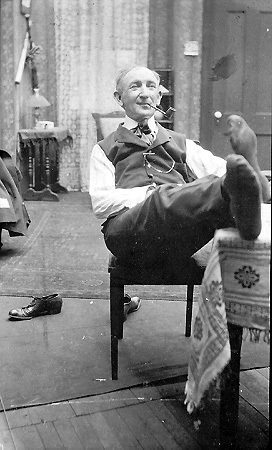 While in Jacksonville he lived in an apartment on Main Street and kept some pet chickens. The Sunday Times-Union, Jacksonville, Florida, January 23, 1916, printed this fascinating item: "One of the evening papers of Worcester, Massachusetts, a few weeks ago published a news item headed President Pro Tem of U.S. Senate, Senator J.P. Clarke.' Not having a picture of the senator they went through their files of cuts, and selected the most distinguished-looking gentleman, a half-tone of Riley Chamberlin, one of the Thanhouser character men. The picture was coupled with the article, which was syndicated to newspapers all over New England. All went well until a number of movie fans recognized the Mutual Movie' trademark on the Chamberlin cut and recognized their movie friend Riley, and immediately Riley's mail became flooded with applications for political jobs. His Passing: In 1917 the actor was seen in the release of Her New York. He remained with Thanhouser until his death in New Rochelle on January 23, 1917. His survivors included two sisters, Mrs. H.M. Winslow, of New York City, and Belle Chamberlin, a contralto with the Boston Opera Company. From 1913 to 1915, New Rochelle city directories gave his home address as 74 Main Street. The New Rochelle Evening Standard, January 24, 1917, printed this item: "Though toddering and feeble, Riley C. Chamberlin would not surrender to the inevitable and retire from active life. He clung to his career as an actor and his friends believe that his forced retirement, which was to take place today, broke his heart. He was found dead in his room in his boarding place, 3 Prospect Street, lying on his bed fully dressed about 4:30 o'clock yesterday afternoon. Health officer Edwin H. Codding, who examined the body, decided that his heart just stopped, probably due to some emotion. He had been a sufferer from valvular heart disease and diabetes for some time and was in the New Rochelle Hospital for a while. Mr. Chamberlin was to have been sent to the Elks Home at Bedford, Virginia and was to start today. He had worried over his forced retirement and did not wish to leave New Rochelle. A few days ago he wept when he was talking of it with a friend. His feeble condition, which became more pronounced in the last year, was another source of sorrow, and it is said that more than once he told friends he would kill himself. "It is said Mr. Chamberlin never married [sic] because of his mother who is living in Grand Rapids, Michigan and who is 90 years of age. He is also survived by two sisters, Miss Belle Chamberlin, Detroit, and Mrs. Mary C. Winslow, New York City. In his will, which was prepared by Jacob S. Ruskin, he strictly enjoins both his sisters to use the property he leaves for the support of their mother. It is said he leaves about $1,000 in cash. The will requests an Elk funeral, the Elk service to be performed by New Rochelle Lodge BPO Elks. He directs that he will be buried in New Rochelle. The will was made about five years ago. Chamberlin was a native of Grand Rapids, Michigan, and was 62 years of age. He became an actor more than 25 years ago and played with many prominent actors, including Edwin Booth and had parts with many Shubert and Frohman productions. His last stage appearances were in Blue Mouse and Excuse Me. He was a clever comedian and character actor. During his stage career he spent some time in the stock company of Edwin Thanhouser in Milwaukee. It was because of this connection with Mr. Thanhouser that he finally turned to the movies. He joined the Thanhouser forces six and a half years ago and remained with them continuously. One of the big productions in which he was prominent was In a Garden, one of the first two-reel pictures produced. He has starred in many Thanhouser productions including Conductor 756 [sic]. His body has been taken to Davis Mortuary Chapel, where the funeral will take place." The January 26th issue of The Evening Standard told more: "Many friends attended the funeral of Riley Chamberlin, a Thanhouser actor, in Davis Chapel yesterday afternoon. The local lodge of Elks performed the service led by exalted ruler Richard Leo Fallon and Hugh C. Harris as chaplain. At the conclusion the members of the lodge passed the open casket and placed on his breast white carnations and ivy. Among the flowers were two standing wreaths, one from the Elks and the other from the Thanhouser Relief Fund. The interment was in Beechwood Cemetery. The casket was of solid chestnut with silver mountings. Among the mourners was Mr. Chamberlin's sister, Miss Belle Chamberlin, who came from Detroit, Michigan. Among the others were Edwin Thanhouser, president of the Thanhouser Film Corporation, Miss Jessie B. Bishop, secretary of the corporation, Lloyd Lonergan, chief of the scenario department, Phil Lonergan, scenario editor, Frank Grimmer, director of casts, Charles Gercke, factory superintendent, F.L. Zimmerman, head of the joining room, Mrs. Frank Farrington, Nick Woods, Arthur Bauer, Lindsay Morison, Dr. George S. Lion, Dr. S. Henry Disow, civil service commissioner, George E. Maxcy, and former police commissioner, Andrew J. Rosch." The New Rochelle Evening Standard, July 9, 1917, reported: "The will of the late Riley C. Chamberlin of New Rochelle has been filed for probate with surrogate Sawyer. He leaves $1,000 worth of personal property and gives all of his personal effects and money and bank to his sister, Mrs. Belle Ellsler and he enjoins her to use the bequest in supporting his mother, Mrs. Martha R. Chamberlin, during her lifetime. The will appoints his sister, Mrs. Belle Ellsler executrix of his will, which was dated September 18, 1916." Note: His surname was often misspelled as "Chamberlain" in news articles and publicity notices, including official Thanhouser advertisements.